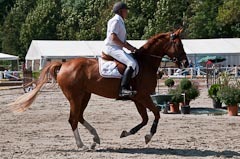 Riding into competition on a green horse generates its own unique pressures. Aside from the normal nerves, a host of anxieties often get tossed together during those last few minutes of warm-up when your number has just been called. Then there are those stubborn insecurities jabbing through the back of your brain as you head through the gate and into the show pen; is this horse really ready for this? Good trainers understand the issues and develop their own strategies, while veteran professionals have learned how to minimize the pressure and risks at every level. They know they can’t pay the bills laid up with an injury and its vital that the horse they’re on have a safe and positive experience. Good show horses, like good riders, are made after all, they don’t just pop out ready to take on the world- somebody had to be the test pilot. Changing leaves and a nip in the air marked the close of my first summer here in southern Switzerland. Throughout the season, my newly adopted home barn, Scuderia alle Gerre had been an active bustling hive. Riders and horses constantly coming and going, many in serious training while others just having fun. There was the summer kid’s program, the Swiss rider certification program and two big hunter jumper shows. 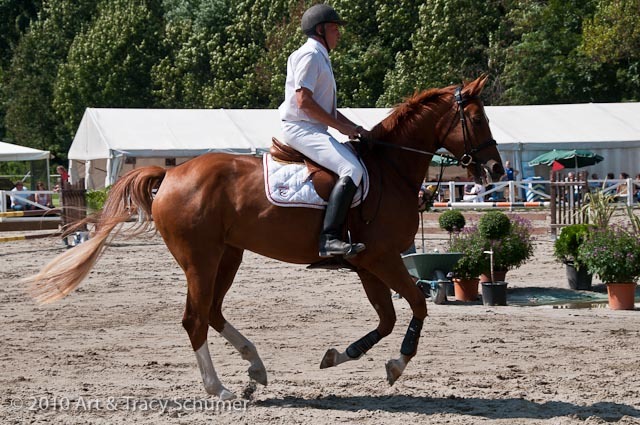 All summer long, we watched trainer Derek Frank work patiently with two special beginner students; a pair of Belgian bred warmbloods that he was painstakingly preparing to ride in their first show. Both four-year-old, Grand Prix hopefuls, had arrived as green colts in the spring. Derek spent several months training them from scratch. The big end of summer extravaganza jumper show would be Derek Frank’s testing ground. With nearly two hundred entries and a complex course of fences, he’d set a high goal for the two youngsters but Derek was confident; he’d long ago stacked the deck in his horse’s favor. The first potential hazard for any green show horse is unfamiliar surroundings. Derek knocked this issue off the list by picking the show held at his own barn, on his own ground. He trained his two colts using the very same jumps and arena that would be used for the show- another problem solved. Big crowds and commotion can keep a good horse from even making it into the show pen so Derek worked his two young jumpers during the barn’s peak busy hours whenever possible. His most important strategy, was the fact that he’d spent so much time carefully building up the confidence of his horses. 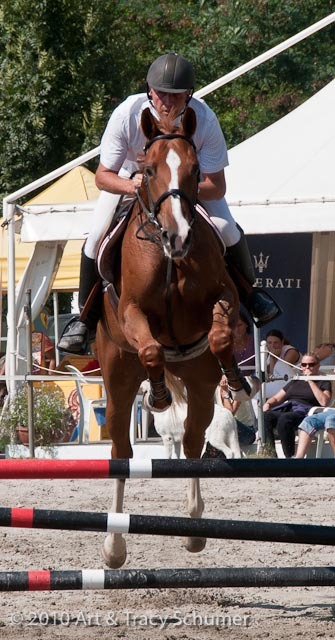 Both colts were bred to be top show jumpers and they were each talented athletes. When graduation day did arrive, Derek Frank’s horses knew exactly why they were there and what would be expected of them. It’s interesting to note that Derek rode both horses in an eggbutt snaffle bit, he wore no spurs and carried no whip. Show time, Derek’s first go was aboard the elegant grey gelding Arsenic Sitte. “I went into the arena as early as would be allowed,” says Derek Frank, “I wanted to have as much time as possible to let my horse see everything and get used to everything happening around him. 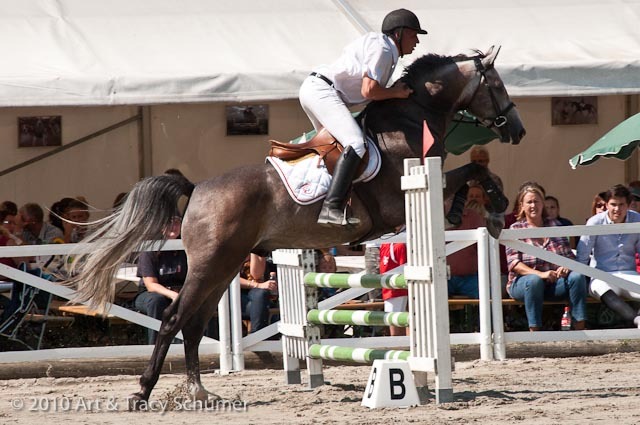 I wanted him to have a good look at all the jumps, especially the ones I knew would be the most difficult for him.” Derek loped the tall grey quietly around the show arena jammed with spectators and when the start bell sounded, he confidently lined up the young horse for his very first jump in live competition. Fence one goes clear and now it’s on to the second- clear again and by the third jump, Arsenic Sitte is looking like a veteran already. The young horse’s pace is even and steady, each approach is measured, strait and precise. What was just minutes ago, a green colt is now a show horse; effortlessly taking flight with his skilled test pilot aboard. At mid-course the grey still looked strong and fit clearing every jump but the combination with double-oxer was yet to come. Without hesitation, Arsenic Sitte cleared the combination which was positioned right in front of the noisy hospitality tent. Finishing out the course with a clear round, Derek Frank calmly exited the arena to light applause. Few people knew what he had just accomplished, even fewer knew he had a second ride on another green horse yet to come. Anisette De Lassus, would be his second go of the day. Also bred in Belgium, this beautiful chestnut filly was the more challenging of the two but potentially, the more talented. Once again Derek entered the arena at the earliest time the rules allowed and once again, when the bell sounded he wasted no time putting his horse to work. The young filly took every jump without hesitation and for the second time that day, Derek Frank exited the arena with a clear round. We look at the top competitors riding in the most important events and we think we are seeing the best that competition has to offer or to teach us. We often overlook the veteran professionals in our own backyard that have accomplished extraordinary things with their horses and students. Without TV cameras present or a world stage to perform on, these dedicated horsemen are out of sight for the most part but for those of us who are paying attention, they have so much more to offer. Have you had a great experience with your local trainer? We’d like to hear about it, share your thoughts in our comment section. Comments for "Putting The Odds in Your Favor"
Sue on December 07, 2010 wonderful article, love the way you present the subject and draw the reader into the article. Always well done.